[CREAT WARM AMBIANCE] Our commercial grade string lights creates a beautiful warm soft ambiance when relaxing, enjoying the evening. It adds flair to bistro deck porch patio garden backyard terrace pergola café restaurant malls for wedding BBQ party banquets, also suitable for tree-lighting like Christmas tree. 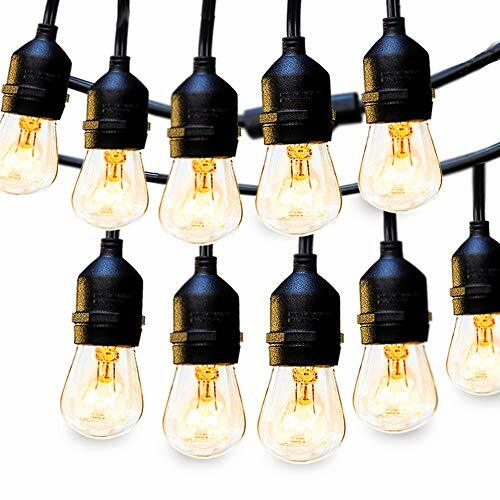 [IDEAL OUTDOOR LIGHTING] 96ft in total.Each strand contains 15 E26 based hanging sockets, provided with 11W S14 incandescent bulbs . The distance between bulbs is approximately 3.85FT. This Heavy-duty light is bright enough and ideal illumination anywhere. [SMART INSTALLATION] Each socket has hanging hook above, makes it easy for hanging with hooks, guide wires, or zip ties. It can connect with another simply use grounded cord plugs into any standard outlets. Link up to 3 strands.